Liverpool legend Robbie Fowler took on Manchester United’s Gary Neville on Wednesday 30th May in a charity match to raise funds for homelessness charities in Liverpool and Greater Manchester. Both teams were packed with football legends and celebrities from Manchester and Merseyside. As a follow up from the game at Walton Hall Park in October, the Liverpool Mayor’s XI faced Manchester Mayor’s XI, at Leigh Sports Village, the match was organised by Metro Mayors Steve Rotheram and Andy Burnham. 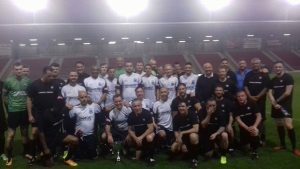 The two teams included footballing legends from across the two cities and homeless players from Liverpool Homeless FC and Manchester based Equality FC. Before Kick off the crowd were entertained by Bolton indie band The Jade Assembly. It was an emotional night as the father of Saffie Roussos, the youngest of the 22 people killed in the Manchester Arena attack last year, Andrew Roussos led out the Manchester team. Whilst, Liverpool were led out by Hillsborough campaigner Margaret Aspinall. 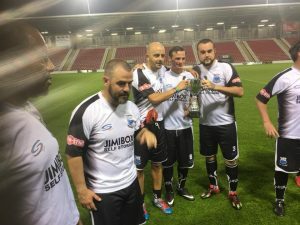 Our three players couldn’t believe that they have suffered homelessness and yet they were stepping on to the pitch to play in a celebrity charity match. They were overwhelmed by the occasion and have some wonderful memories to treasure for the rest of their lives. “When we got to the ground we were taken through the crowds by security, it was like we were celebrities. I couldn’t believe I was really sitting in the changing rooms with them all. When we were on the pitch and they read the teams out and I heard my name, it was just unbelievable. I was there playing with football legends from Liverpool and Everton. Playing in the same team as Robbie Fowler, Howard Gayle, Stuart Barlow. Actually having banter with Manchester Utd’s Gary Neville, he was funny. After the match everyone was like one big team, all laughing and joking. The whole thing was great, it was an experience I will never forget”. Everyone at the club would like to thank Steve and Andy for arranging this exciting event. Also for giving the lads this once in a lifetime opportunity.